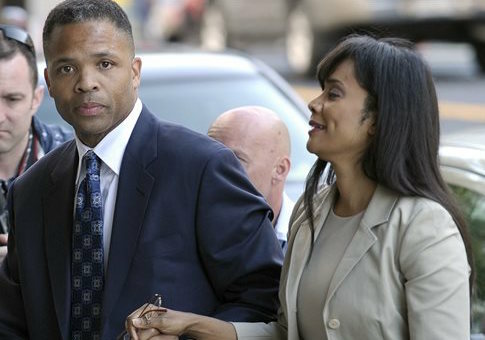 Former Rep. Jesse Jackson, Jr. (D., Ill.) and his estranged wife are nearly $2 million in debt. Jackson, the son of activist Jesse Jackson, told reporters on Tuesday that he and Sandi Jackson, a former member of the Chicago City Council, owe approximately $1.8 million for legal bills and fees, the Chicago Sun-Times reports. Jackson was a congressman from Chicago for 17 years, but took a leave of absence in 2012 to be treated for his bipolar disorder. It was then found that he spent $750,000 in campaign funds on personal expenses, while Sandi had omitted $580,000 on their taxes. Jackson was sentenced to 30 months in prison, and Sandi was sentenced to 12 months in prison. Neither Jackson nor Sandi has worked since getting out of prison, but Jackson has been collecting $138,400 annually from the federal government in workers compensation benefits and temporary disability, the Washington Free Beacon reported. Now, Jackson and Sandi are in the midst of a divorce. Jackson filed for divorce in Chicago, while Sandi filed for divorce in Washington, DC, and each has attorneys in both cities. Jackson has child support payments and a mortgage on the couple's house in Chicago, and the couple also has remaining penalty fees from their criminal cases. Jackson said on Tuesday while he went into court in Chicago that he would like to go back to work again. "I’m thinking of becoming a divorce lawyer," Jackson joked. This entry was posted in Politics and tagged Chicago, Jesse Jackson. Bookmark the permalink.